Hi everyone! Just a quick card for you today that I am entering into My Creative Time's Designer Challenge. It was a color challenge to use at least 3 of six colors, but I decided to go for the whole rainbow and use them all :) I'm also going to enter this into the Ribbon Carousel Showers and Flowers Challenge. I love that I was able to use so many of my Trendy Twine colors--they really look great together! This is just super. Love all those pretty colors.Hope you will stop by and link up at Craftin Desert Divas “Button” Linky Party. Helen, seriously LOVE this card, The colors are just so pretty. Your card is so beautiful, love all of the colors together! 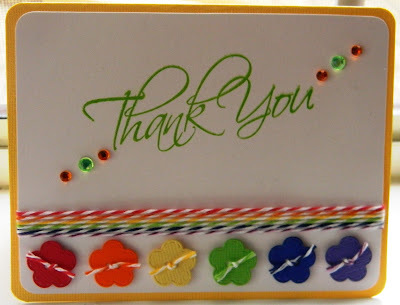 Thanks for joining us at Craftin Desert Divas Button Linky Party. This is so cute, love what you did wtih the twine!! Helen ~ Oh this is soooo FABULOUS! I LOVE that you added the twine and the gems! WOW! Thanks for joining us over at My Creative Time ~ Designer Challenge!